In the summer of 2013, Özge Siğirci, a young scientist in Turkey, had not yet arrived at Cornell University for her new research stint. But she already had an assignment from her future boss, Brian Wansink: Find something interesting about all-you-can-eat buffets. As the head of Cornell’s prestigious food psychology research unit, the Food and Brand Lab, Wansink was a social science star. His dozens of studies about why and how we eat received mainstream attention everywhere from O, the Oprah Magazine to the Today show to the New York Times. At the heart of his work was an accessible, inspiring message: Weight loss is possible for anyone willing to make a few small changes to their environment, without need for strict diets or intense exercise. When Siğirci started working with him, she was assigned to analyze a dataset from an experiment that had been carried out at an Italian restaurant. Some customers paid $8 for the buffet, others half price. Afterward, they all filled out a questionnaire about who they were and how they felt about what they’d eaten. Somewhere in those survey results, the professor was convinced, there had to be a meaningful relationship between the discount and the diners. But he wasn’t satisfied by Siğirci’s initial review of the data. “I don’t think I’ve ever done an interesting study where the data ‘came out’ the first time I looked at it,” he told her over email. More than three years later, Wansink would publicly praise Siğirci for being “the grad student who never said ‘no.’” The unpaid visiting scholar from Turkey was dogged, Wansink wrote on his blog in November 2016. Initially given a “failed study” with “null results,” Siğirci analyzed the data over and over until she began “discovering solutions that held up,” he wrote. Her tenacity ultimately turned the buffet experiment into four published studies about pizza eating, all cowritten with Wansink and widely covered in the press. But that’s not how science is supposed to work. Ideally, statisticians say, researchers should set out to prove a specific hypothesis before a study begins. Wansink, in contrast, was retroactively creating hypotheses to fit data patterns that emerged after an experiment was over. Now, interviews with a former lab member and a trove of previously undisclosed emails show that, year after year, Wansink and his collaborators at the Cornell Food and Brand Lab have turned shoddy data into headline-friendly eating lessons that they could feed to the masses. 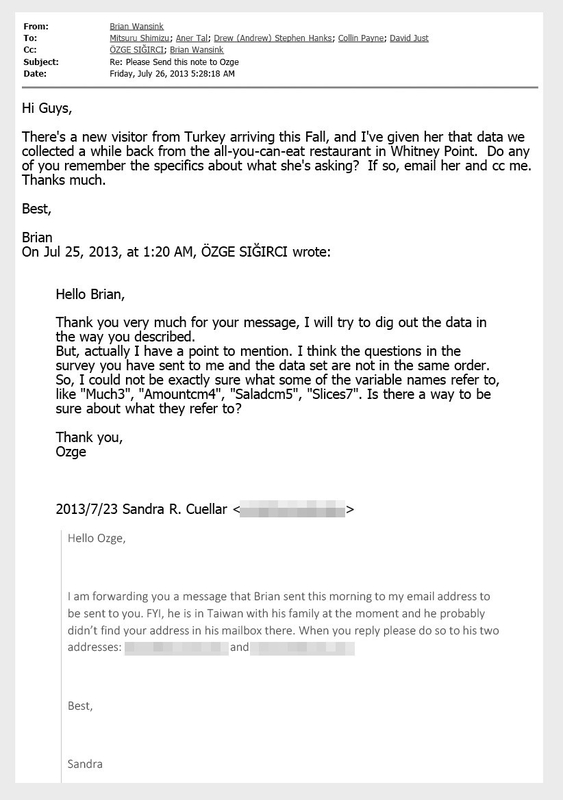 The correspondence shows, for example, how Wansink coached Siğirci to knead the pizza data. All four of the pizza papers were eventually retracted or corrected. But the newly uncovered emails — obtained through records requests to New Mexico State University, which employs Wansink’s longtime collaborator Collin Payne — reveal two published studies that were based on shoddy data and have so far received no public scrutiny. Still, Wansink defends his work. He pointed out that an independent lab confirmed the basic findings of the pizza papers. “That is, even where there has been unintentional error, the conclusions and impacts of the studies have not changed,” he wrote. Siğirci and Payne did not respond to requests to comment for this story. “I am sorry to say that it is difficult to read these emails and avoid a conclusion of research misconduct,” Brian Nosek, a psychologist at the University of Virginia, told BuzzFeed News. As executive director of the Center for Open Science, Nosek is one of his field’s most outspoken reformers and spearheaded a massive project to try to reproduce prominent discoveries. Wansink in the Food and Brand Lab in 2006. The so-called replication crisis has punctured some of the world’s most famous psychology research, from Amy Cuddy’s work suggesting that “power poses” cause hormonal changes associated with feeling powerful, to Diederik Stapel’s fabricated claims that messy environments lead to discrimination. In an influential 2015 report, Nosek’s team attempted to repeat 100 psychology experiments, and reproduced less than one-half of the original findings. One reason for the discrepancy is “p-hacking,” the taboo practice of slicing and dicing a dataset for an impressive-looking pattern. It can take various forms, from tweaking variables to show a desired result, to pretending that a finding proves an original hypothesis — in other words, uncovering an answer to a question that was only asked after the fact. In psychology research, a result is usually considered statistically significant when a calculation called a p-value is less than or equal to 0.05. But excessive data massaging can wind up with a p-value lower than 0.05 just by random chance, making a hypothesis seem valid when it’s actually a fluke. But for years, Wansink’s inbox has been filled with chatter that, according to independent statisticians, is blatant p-hacking. “Pattern doesn’t look good,” Payne of New Mexico State wrote to Wansink and David Just, another Cornell professor, in April 2009, after what Payne called a “marathon” data-crunching session for an experiment about eating and TV-watching. In a conversation about another study in August 2015, Wansink mentioned a series of experiments that “were chasing interactions that were hard to find.” He apparently hoped that they would all arrive at the same conclusion, which is “bad science,” said Susan Wei, an assistant professor of biostatistics at the University of Minnesota. In 2012, Wansink, Payne, and Just published one of their most famous studies, which revealed an easy way of nudging kids into healthy eating choices. By decorating apples with stickers of Elmo from Sesame Street, they claimed, elementary school students could be swayed to pick the fruit over cookies at lunchtime. But back in September 2008, when Payne was looking over the data soon after it had been collected, he found no strong apples-and-Elmo link — at least not yet. Wansink also acknowledged the paper was weak as he was preparing to submit it to journals. The p-value was 0.06, just shy of the gold standard cutoff of 0.05. It was a “sticking point,” as he put it in a Jan. 7, 2012, email. Later in 2012, the study appeared in the prestigious JAMA Pediatrics, the 0.06 p-value intact. But in September 2017, it was retracted and replaced with a version that listed a p-value of 0.02. And a month later, it was retracted yet again for an entirely different reason: Wansink admitted that the experiment had not been done on 8- to 11-year-olds, as he’d originally claimed, but on preschoolers. Still, the Food and Brand Lab appears to approach science far more flagrantly than most other scientists who face the same pressures, Nosek said. Back in March of last year, shortly after his pizza papers were called into question, Wansink was interviewed by the Chronicle of Higher Education. He told the outlet that before all the hubbub over his studies, he’d never heard of the term “p-hacking” or the replication crisis. “Science is messy in a lot of ways,” he said. The emails reviewed by BuzzFeed News point to potential problems with two of Wansink’s studies that haven’t received any public criticism. In July 2009, Wansink wrote to collaborators about a study in progress. Mall shoppers had been asked to read a pamphlet that described one of two kinds of walks — one that focused on listening to music and the other on exercising. At the end, researchers offered them salty and sweet snacks as a thank you, and recorded how much participants served themselves. Werle did not respond to a request to comment for this story. The study wound up in the journal Appetite two years later, claiming that just the act of imagining physical activity prompts people to take more snacks. In 2013, Werle and Wansink were discussing a different study about whether describing a walk as fun, such as by framing it as a scenic stroll rather than a form of exercise, influenced how much the walkers would want to eat afterward. The scientists emailed back and forth about two facts that the subsequent paper did not disclose: that the “exercise” group was much smaller than the “fun” group, and that there was some missing data. “Why are you hiding that? That seems like pretty pertinent information,” Sainani of Stanford said. Wansink himself acknowledged that the data was weak. At one point, he told Werle that he didn’t think the study was good enough to submit to a prestigious journal. In another message, he mentioned that “there’s been a lot of data torturing with this cool data set.” The journal Marketing Letters eventually published the paper in May 2014. Journals should scrutinize these two papers due to questions raised by the emails, said Nick Brown, an independent graduate student at the University of Groningen in the Netherlands who has spent more than a year dissecting Wansink’s work. The paper that told walkers to think of their exercise as fun, for example, reports p-values of 0.04 and less than 0.05. But by Brown’s calculation, they appear to have been cut in half using an unjustified statistical method. (Wei said the group’s method may have been acceptable.) And one of Werle’s emails to Wansink indicated that one of the experiments had 47 people, but the paper reports 46. Brown remains befuddled by the breadth of errors that he and other critics have unearthed in the Food and Brand Lab’s research, from data impossibilities to sample sizes that don’t add up. Wansink demonstrates his "bottomless bowl of soup" after he was awarded a 2007 Ig Nobel Prize. These papers are only a fraction of the 250-plus that Wansink has produced since the early 1990s. One of the driving factors behind his prolific output, his emails suggest, is a hard truth that all academic scientists face: The more papers you publish, the more likely you are to be rewarded in promotions, funding, and fame. In August 2012, Wansink relayed some sad news to more than a dozen colleagues: One of his former grad students had just been denied tenure. “Whenever I called her, it always seemed like she was working on a ton of stuff,” he wrote. Yet he was surprised to see that she’d only published one article in a minor journal in seven years. This unnamed scholar was working on lots of research that never saw the light of the day, Wansink wrote: “Too much inventory; not enough shipments.” Ideally, he mused, a science lab would function like a tech company. Tim Cook, for instance, was renowned for getting products out of Apple’s warehouses faster and pumping up profits. “As Steve Jobs said, ‘Geniuses ship,’” Wansink wrote. Kirsikka Kaipainen knows firsthand how the Food and Brand Lab manages to churn out so many papers. She did research there in 2012 as a graduate student visiting from Finland. Wansink was “warm and generous and energetic, somebody who would take you in with open arms,” she recalled. Soon after she arrived, Wansink handed her a dataset from an online weight-loss program run by the lab. At a brainstorming session, he led the charge in proposing a half dozen or so papers that could come out of the data, Kaipainen said. Kaipainen eventually steered the paper to a place she was comfortable with, a straightforward review of how the program worked. Wansink was fine with it, she said, since it wound up in a notable journal. But even though his name is on it, he had little to do with writing it — and his few contributions made her uneasy, she said. As months went by, Kaipainen began to notice that her experience fit into a disturbing pattern in the lab as a whole: Collect data first, form hypotheses later. She isn’t the only former lab member who felt troubled by how the place was run. Other students have told the Cornell Daily Sun that Wansink and his team often chased down findings that were intuitive-sounding yet overly broad and unreliable. Even when writing manuscript drafts, Wansink was thinking about how to sell his inspirational results to the public. “We want this to go virally big time,” he wrote to Payne, Just, and another Cornell colleague on March 27, 2012, explaining why he wanted to make the chart labels for the Elmo and apples study sound “more generalizable.” Another time, he discussed playing up “the quotable point” of the study. To Nosek, the relentless pursuit of fawning press is just one element of a backward rewards system in science. When a university is deciding who to hire, or a funding institution is selecting a grantee, it’s easy to pick those who are publishing a lot, he said. Scientists often rely on peer reviewers — anonymous experts — to weed out errors in papers before they go to press. But journals didn’t, or couldn’t, catch every inaccuracy from the Food and Brand Lab. Last fall, Wansink admitted that the lunchtime observation part of the carrots study had actually been done on preschoolers, not the reported 8- to 11-year-olds (just like the Elmo and apples article). The paper was corrected on Feb. 1, shocking critics who had called for a full retraction. In their defense, the researchers noted that a sub-experiment mentioned in the study did involve elementary schoolchildren. “These mistakes and omissions do not change the general conclusion of the paper,” they wrote. The scientists who reviewed the Elmo study in JAMA Pediatrics didn’t seem to raise any red flags either, based on Wansink’s responses to them. But the journal correspondence does point to a bizarre new discrepancy. Sometimes, the team’s acceptance into top journals surprised even them. In July 2009, Payne and Just, the Cornell professor, were celebrating a paper that had landed in the Annals of Behavioral Medicine. When their work was rejected, the members of the Food and Brand Lab would often try increasingly lower-quality journals until they succeeded. This practice is in part responsible for the sheer volume of scientific findings that cannot be replicated. Even so, Wansink and his colleagues were sometimes frank about their desire to put flawed data in publications with low standards. In March 2009, Wansink asked Payne to look over a manuscript about how people shop in foreign countries where they’re unfamiliar with the brands or language. Wansink had written it with Koert van Ittersum, a professor at the University of Groningen, who did not respond to a request for comment. Time was crucial. “At this point,” Wansink wrote, “we don’t want to redo any studies, just deal with the ones we have and find an editor that says, ‘Interesting, and good enough.’” So far, none have. To Brown, the grad student who may know Wansink’s work better than Wansink himself, the lab is like a food-processing company. A 2012 study in Preventive Medicine reported that schoolchildren ate more vegetables at lunch when they had catchy names like “X-Ray Vision Carrots.” A previous version of this story misstated that name. Amy Cuddy’s research suggesting that “power poses” cause hormonal changes associated with feeling powerful has not been replicated. An earlier version of this story suggested that her research linking “power poses” to feeling confident has not been replicated, but this finding has been replicated.